Wonton Soup and dumplings have always been an obsessed favorite of mine since I was a young girl in Hong Kong. Foodies and veteran Chinese wonton chefs hold high standards to judge a good wonton soup from an inferior one. Wonton soup is a beloved Chinese dish with its delicate taste and fineness appraised by poets since the Tang dynasty (618 – 907 AD). Yet, many modern food lovers still debate over which local chef’s wonton is the best. The most famous kind is the Cantonese Hong Kong-style version. The wontons are mostly made up of fresh shrimp, with a little bit of ground pork. The delicately seasoned filling is then wrapped in high quality Hong Kong style thin wrapping skins. The best wrapping skins used by high-end wonton chefs in Hong Kong have such a smooth feel in the mouth that they are nicknamed “魚皮” (Yú pí) which literally means “fish skin” in Chinese. Wontons are traditionally served as a meal by itself with a little bit of chopped yellow chives in a clear light broth. Thin egg noodles and some bok choy or choy sum can also be added to make a Wonton Noodle Soup. Yet another way that many Westerners enjoy wontons is to deep-fry them and serve as an appetizer with sweet-chili sauce. In the proper traditional ways of serving wontons, the wonton broth is just as important of a component in a good bowl of wonton soup as the wontons themselves. The two work together to enhance the other’s flavor, without single-handedly over dominating the palate. 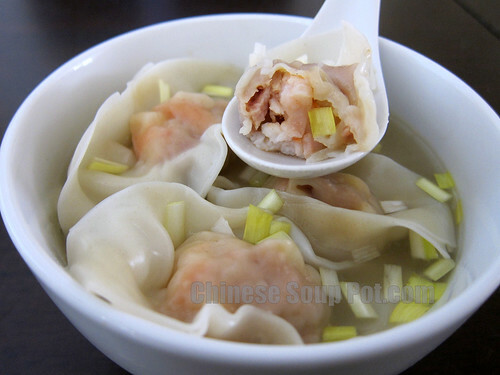 Here in my recipe below, I provide step by step simple instructions to show you how to make my delicious, authentic Cantonese Hong Kong style wonton soup. The preparation and wrapping of wontons is also a great family activity to do with the kids. So have fun! While fresh wontons taste the best, they can be pre-made in large quantities and stored in the freezer for future use. To freeze wontons, place them on a baking sheet lined with parchment paper. Make sure the wontons are not touching each other to prevent the skins from sticking or tearing later on. Once frozen, remove the wontons from the baking sheet and put them in a freezer ziploc container. Place the container of wontons back into the freezer until you are ready to serve them. The use of a container will prevent the wontons from getting crushed by other things in the freezer. The recipe below will make 90 wontons. Enjoy! Cut the shrimp into small pieces and place in a large bowl. Combine all wonton filling ingredients and seasonings with the shrimp. Mix well. Let marinade for 30 mins. 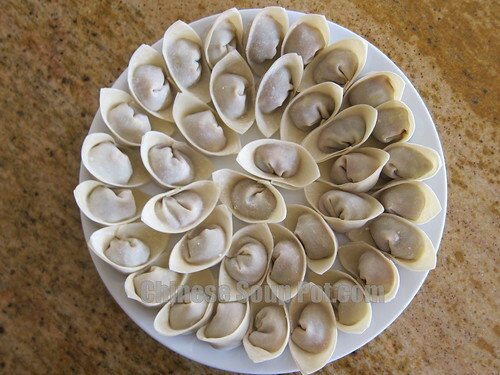 Wrap the wontons by placing ¾ tsp of the filling into the skin and fold. This is a great activity to get kids and the whole family sitting down together and involved in. 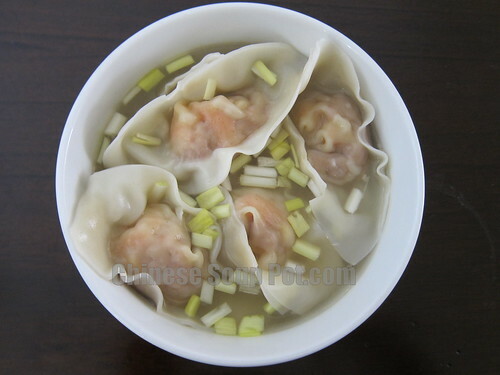 When ready to serve, cook the wontons in an open pot of boiling water. When they float to the top (about 2- 3 minutes), they are cooked. Scoop the wontons into serving bowls. Heat up your premium wonton broth separately before pouring into the bowls of wonton. (If you are in a hurry, you can use a low-sodium, canned organic chicken broth as your soup.) Sprinkle the chopped yellow chives into the bowls as garnish and for additional fragrance to the soup. Serve. Tips for Making Good Wonton Soups 1. Do not cook the wontons in the premium broth. The flour from the wonton skin will alter the taste of your broth and make the soup murky. Both of these are undesirable. A good broth should always be tasty, yet clear and light. 2. Use fresh, good quality shrimps for the wonton filling. Of the various types of shrimps out there, I find that the black tiger shrimp have the best flavor, and the most al dente crisp texture. This type of shrimp is best for wontons. 3. See the yellow chives page under the Common Ingredients section for more uses, preparation steps, and buying tips on this ingredients. Wow! Good job with the big photo up on top. Looks awesome! I’ll give this recipe a try. My daughter and I are obsessed with wonton soup. I have to try this recipe out. Thanks for sharing. i love wonton soup. thanks! My kids love shrimp wonton soup and your wontons are OMG so neat!!!! Beautiful wontons ever! I feel like eating wontons tonight. It’s almost dinner time here in Taiwan. Thanks for making me hungry for this soup! This looks so artistic and delicious! These look gorgeous. I agree about using a top quality broth too. I love making wontons! yum! I adore Shrimp Dumplings and Shumai so this looks OUT OF THIS WORLD YUMMY!! !